With all the well-merited excitement over American Pharoah’s [sic] being the first horse to cop a Triple Crown in 37 years, I thought people might like to know a little about the eleven colts who preceded him in attaining this difficult feat. First, you might like to know that the Derby, Preakness, and Belmont Stakes were not officially dubbed the Triple Crown by the Thoroughbred Racing Association until 1950, after Citation (Big Cy) swept them in 1948. In the first quarter of the twentieth-century, they came to be considered the most important races for three-year-olds (the only age allowed to run in them). Then, in the mid-1930s, Charles Hatton of the Morning Telegraph and Daily Racing Form referred to them, unofficially, as the Triple Crown of stakes for three-year-olds when Omaha swept them (Chew 74, Drager 3). 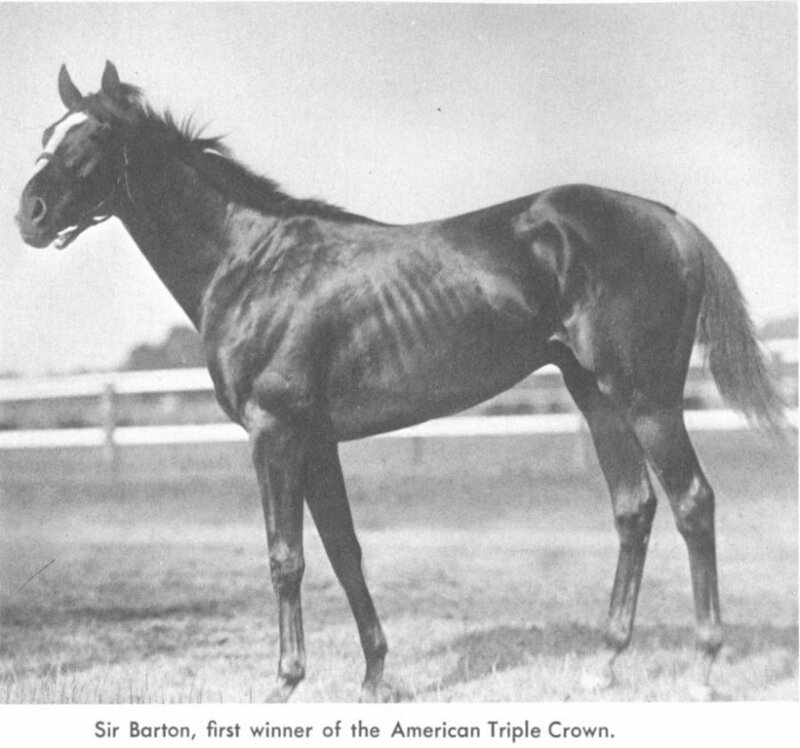 So let’s take a look at the first triple crown champ, Sir Barton. 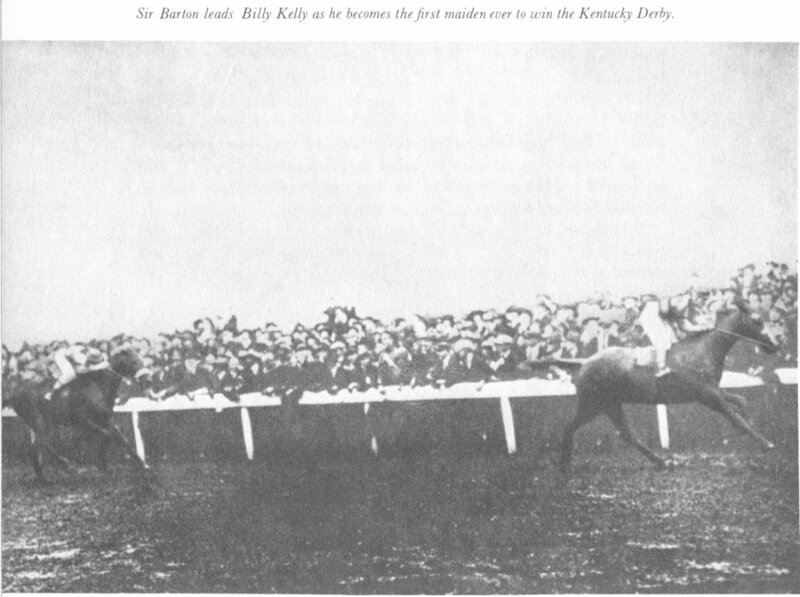 Sir Barton (foaled 1916), a striking chestnut with a white blaze, scored the Triple in 1919. Owned by Canadian J.K.L. Ross, the colt was quite a character. No Kelso who would eat ice cream sundaes from children’s hands, he was more likely to eat the children. As Marvin Drager writes, Sir Barton, “ignored horses, despised humans, and hated pets” (19). Drager posits that Sir Barton’s bad attitude might have stemmed from having had tootsies so tender that he had to be shod with piano felt between his feet and his horse shoes (12, 19). But that orneriness translated to gameness on the track. Even more interesting, Sir Barton was not only the first triple crown winner, but the first maiden to take the Derby. The term “maiden” in horse racing has nothing to do with being demure or virginal. It just means the horse has not yet won a race. The next year, 1920, turned out to be the best and worst of times for Sir Barton. He came home first in numerous stakes and handicaps, carrying impressively high weight (129, 132, 133, 134 lbs.) and defeated 1918 Derby winner and beloved handicapper Exterminator (Old Bones), as well as fine stakes horses such as Wildair, The Porter, and Mad Hatter. Mad Hatter provides us with an interesting transition, since his sire (Fair Play) also fathered Sir Barton’s equine version of Kryptonite: Man O’ War. Now you might have to be of a certain age to know who Man O’ War is, but the truth is that the original “Big Red” was the yardstick against which all great racers were measured––until 1974, when another chestnut colt with a star and stripe on his face copped his nick name and the triple crown. There are still people who see the first Red as the best––I’m one of them. In fact, Man O’ War would undoubtedly have been a member of the Triple Crown club but that his owner (Samuel Riddle) believed that the first Saturday in May was too early to run a young three-year-old 1 1/4 miles––but I drift wide in the stretch (digress). These two met and this time it was Man O’ War’s turn to briefly “indulge.” Then he crushed Sir Barton with an unsurpassable surge of speed in track record time for a pot of $80,000 dollars––not hay in 1920 (Drager 26-27, Robertson 242). Sir Barton raced three more times after this, and though he performed creditably, he still didn’t win (Robertson 242, Drager 28). With nothing left to prove, he was retired, and did fairly well for himself at stud in Virginia. 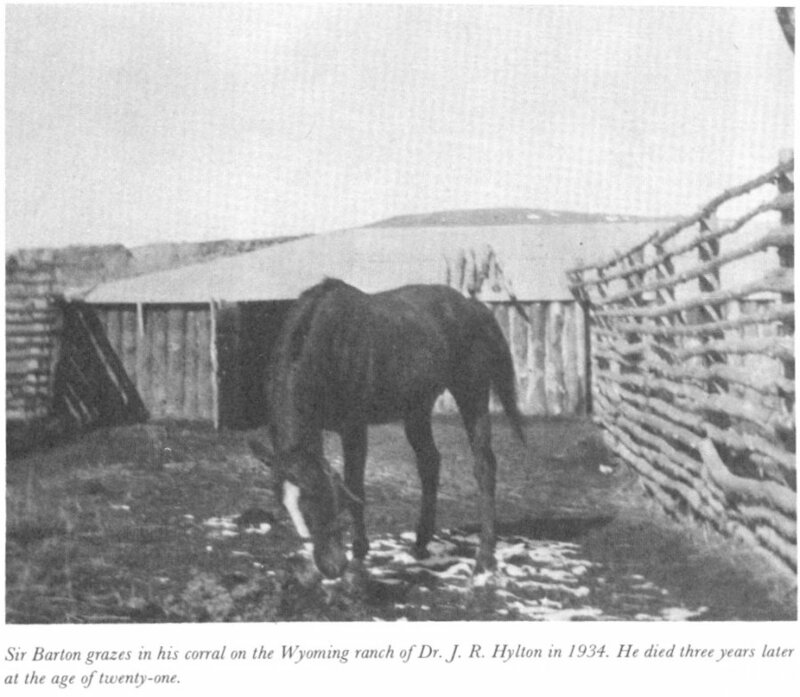 At seventeen, “he was turned over to an U.S. Remount Station.” Eventually, he finished out his days comfortably on a ranch in Wyoming (Drager 28). He doesn’t look so cranky in this picture. Maybe his tootsies weren’t sore from running hard, any more. Sources: The Kentucky Derby: The First Hundred Years (Peter Chew); The Most Glorious Crown (Marvin Drager); The Triple Crown (Bill Lauder) The History of Thoroughbred Racing in America (Willaim H. P. Roberston). Photographs: Sir Barton 1 (Roberston), Sir Barton winning the Derby (Draber), Sir Barton grazing (Drager).